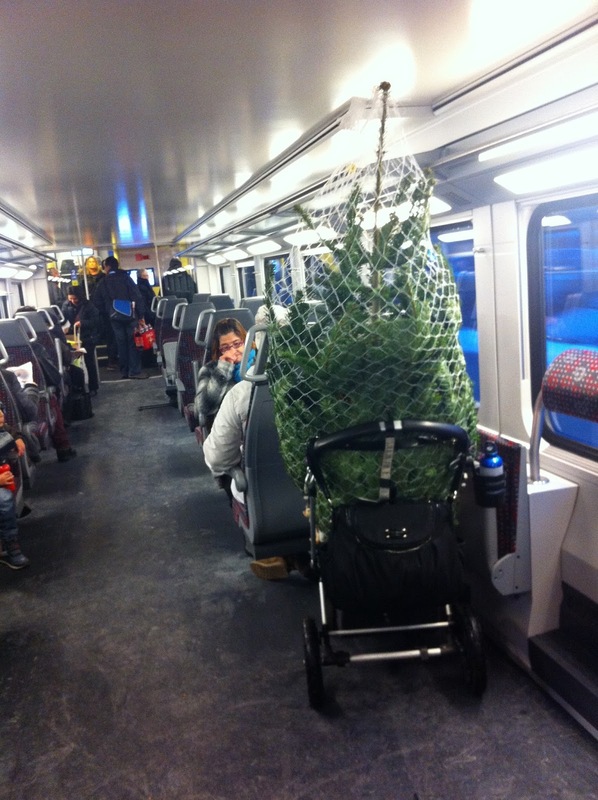 Going to get a Christmas tree in Zurich was always a fun adventure. After you selected your tree, the shopkeeper would wrap it in netting for you. Then it was easy to take on the train or tram - or both! 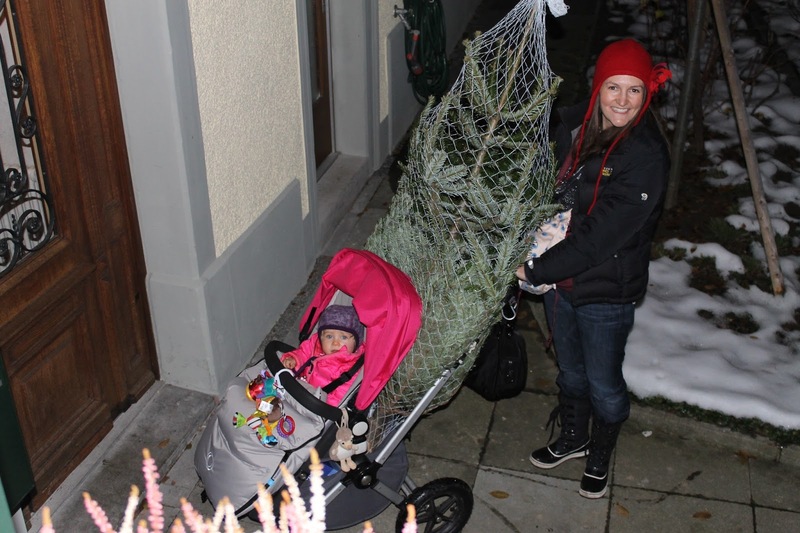 Our last year in Zurich, we kept things simple and all went together and got a tree pretty close to home. 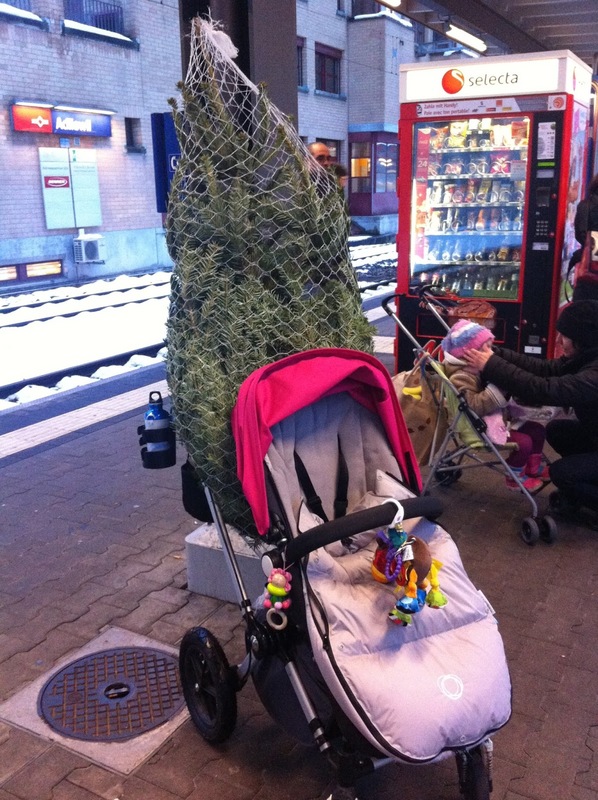 One of us carried Coco, and one of us carried the tree to and from the train, which we only had to ride a few stops. 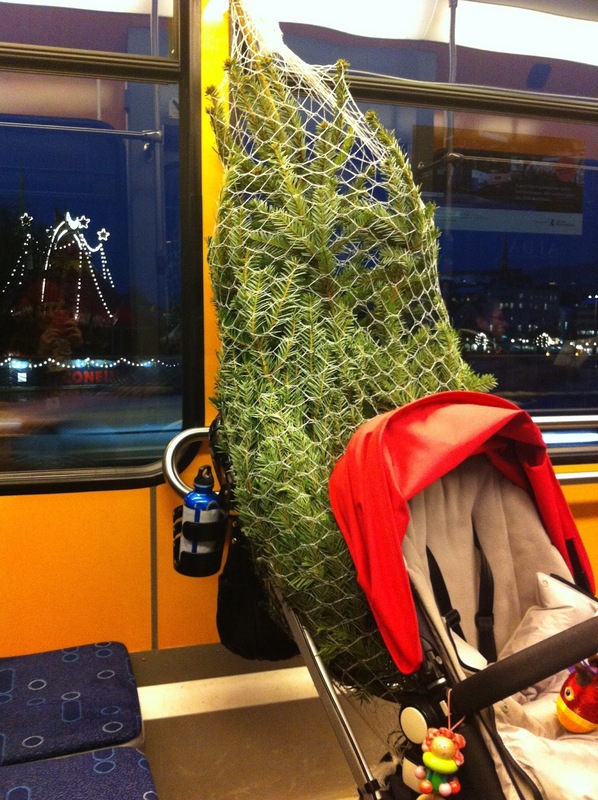 But the year before, most of the places close to home didn't have trees yet and I was itching to have one, so when I saw them in the Migros in Adliswil, I bought one - and took it all the way home to Seefeld on the train and tram. Here we are waiting for the train. The Bugaboo really is the minivan of strollers! And on the train. It was nearing rush hour and as we got closer Zurich's main station, the train was more and more crowded! I opted for more walking, but fewer crowds, and got out one stop early. 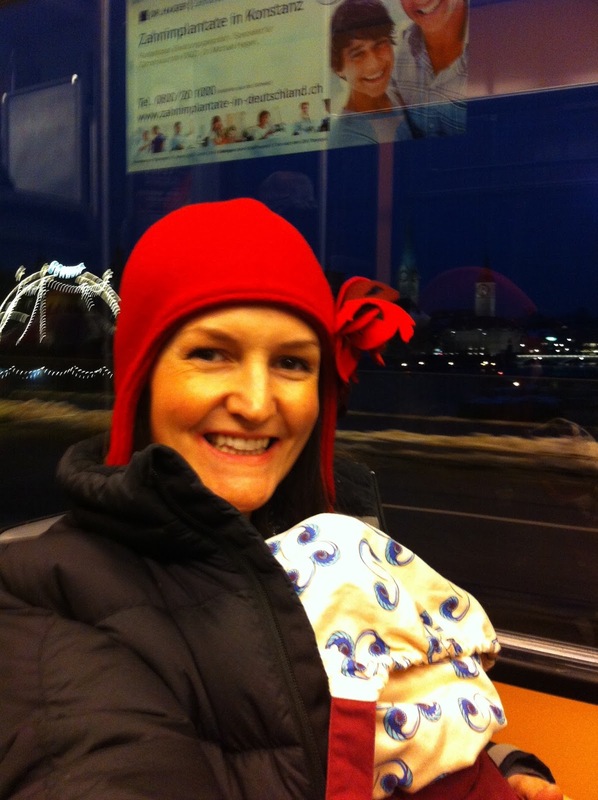 It was pretty romantic to cross over the bridge and go past the circus between Bürkliplatz and Bellevue with a tree in the buggy! Coco was just one-year-old and thankfully slept in the Ergo most of the way. When we got home, J saw us pull up and leaned out the kitchen window to snap a few photos. City living is such a fun adventure. I miss it! 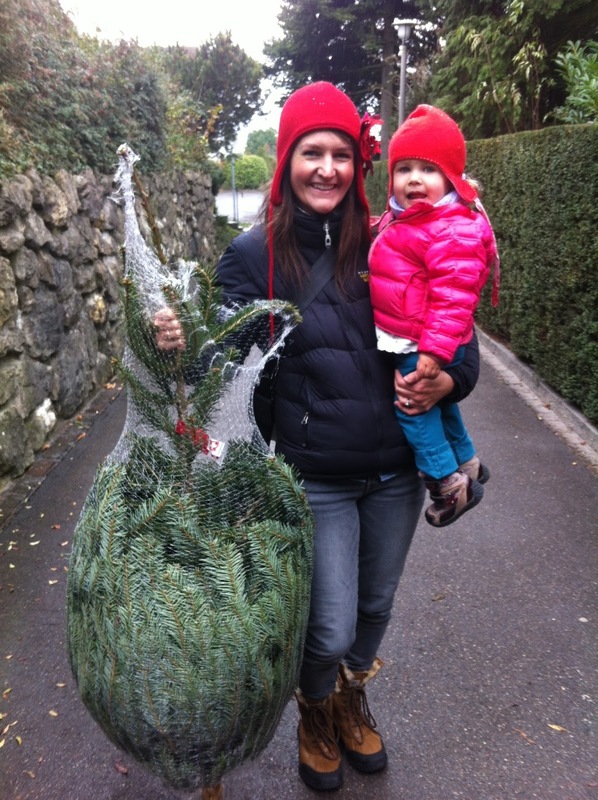 This year and last, J and Coco just went to pick up our tree at one of the local tree spots after school and brought it home in the car with no fuss. Honestly, the fuss was half the fun! Our last christmas in Basel we got our tree at a farm and Philipp had to drive it home in the car while his mom and I pulled Georgia in a sled in the snow for an HOUR because we could not all fit in the car and transportation was spotty up on that mountain. It was hilarious AFTER. It sucked so bad during. Lol. We get our tree from a little league football field just around the corner. I had visions of us pushing our babies in a stroller and pulling our tree on a sled, but it's been so warm here that my parents just met us at the tree place with their truck and drove it home for us. At least we all got a short walk on a nice day! It’s not tough to get Commercial Christmas Tree Hire in Caerphilly, because it can be done quickly by visiting the website of ‘PHs Green Leaf’.